A former Irish soldier who fled to Syria to become an ISIS bride has said she wants to return home. Lisa Smith, 37, has lost her husband and is living in the al-Hol refugee camp in Syria with her two-year-old daughter. She fled the terror group's last holdout in Baghouz and is one of hundreds of women and children at the camp. Speaking to CNN, she said not everyone at al-Hol was a 'terrorist' and said prison in Ireland would be no worse than her life in Syria - as the Irish government confirmed it was trying to bring her home. She said: 'I think that people should just realise that all the people here are not terrorists. I want to go home. Smith was one of hundreds to flee Baghouz as ISIS lost its grip on its final patch of territory in eastern Syria. Irish authorities have been drawing up plans to rescue the former soldier, originally from Dundalk, the Sunday Mirror reported. Speaking today, Irish foreign minister Simon Coveney told RTE that Irish officials were meeting this afternoon to co-ordinate a response. He said: 'We want to look after Irish people and bring them home and if they want to come home. 'Of course, there's heightened concern because there's a two-year-old girl involved in this as well. 'This is an unusual case because of her background in the last number of years, but the Taoiseach and I have made it very clear - she's an Irish citizen. The Irish government had not yet been able to establish direct contact but had been speaking to her family, he said. A source told the newspaper about the possible rescue, saying: 'The bottom line is she is an Irish citizen with a child in a very volatile, war-torn area. 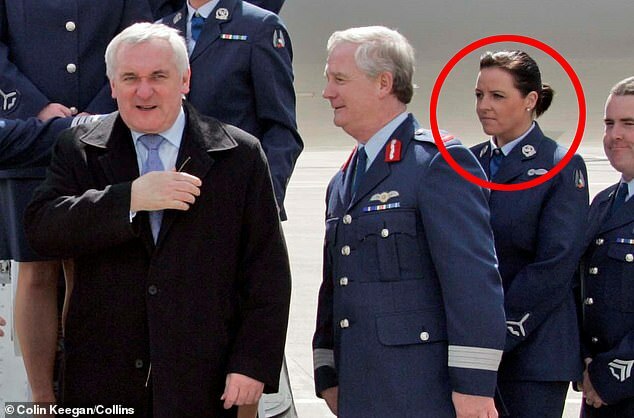 As a member of the Irish military Smith had flown around the world, and in 2008 was pictured on a trip with then-Taoiseach Bertie Ahern. By 2013 she had converted to Islam in Dundalk where she apparently began attending the local mosque and bringing much younger relatives along for the worship. Her Facebook page is also said to have undergone a transformation, from 'cute animal' photos to pictures of her wearing a veil and posts appearing to praise jihadists. Speaking to Extra.ie, Carol or 'Karimah' Duffy said she had tried to keep Smith from turning to radicalism. The Muslim community in Ireland had 'strongly rejected' her extremism, she said, adding that she would have reported her if she had known the extent of her radicalisation. Another friend told The Sun: 'She was a party girl in the sense that she enjoyed going out, drinking and having a good time. 'She was really sound, a really nice girl and someone who was always there for her friends. Later she reportedly described Western culture as 'dirty' saying that her friends had been 'brainwashed' into standing by it. Smith is believed to have left Ireland in 2013 or 2014, apparently travelling to Bizerte in Tunisia where she met her husband. By 2016 photos from Syria had appeared on her Facebook page and rumours that she had travelled there via Turkey had reached her friends in Dundalk. This month a former friend of Smith in Dundalk said Irish police had been guarding the town's Muslim community in the wake of the Christchurch shootings. Ms Duffy said Islamophobic thugs had recently made the link between Smith and Dundalk after the New Zealand terror attack, saying she had 'packets of rashers thrown at my house'. Current Irish PM Leo Varadkar has previously said stripping Smith of her citizenship was not the 'right or compassionate thing to do'. The Irish government's language comes in contrast to British ministers' refusal to allow teenage ISIS bride Shamima Begum to return home. Home Secretary Sajid Javid revoked Begum's passport after she said she wished to return to the UK with her newborn son, having already lost two children. The weeks-old boy later died in a camp in northern Syria, with reports suggesting he had suffered from breathing difficulties. Ms Begum, from Bethnal Green in east London, was 15 when she and two other schoolgirls went to join the terror group in February 2015. Aged 19 and heavily pregnant, she resurfaced in a refugee camp last month and said she wanted to return to Britain as the self-styled caliphate collapsed. International law forbids nations from making people stateless by revoking their only citizenship. But British officials appear to believe that Ms Begum, who is of Bangladeshi heritage, holds dual citizenship and can therefore have her British nationality removed. Under the 1981 British Nationality Act, any Briton can be deprived of their citizenship if it is 'conducive to the public good' - and they do not become stateless as a result.